Located in the pristine beauty of Pahalgam, Kashmir, the Himalaya House is among the award winning accommodation options of the place. The hotel has been constructed in such a way that it complements the beauty of Kashmir. Be it in terms of the architecture or the furniture, everything has special warmth that entices the guests to stay here. 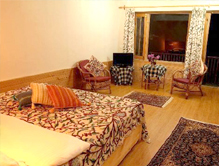 Being one of the top hotels of Pahalgam, the Himalaya House has been facilitated with all the amenities required for a comfortable stay. Moreover, the grand hospitality provided by the hotel staff earns high applauds from the visitors and ensures that the guests cherish every moment spent in the resort. Accommodation The rooms of the hotel have been classified into four categories: Superior Deluxe, Super Deluxe, Deluxe and Standard. This classification has been made to suite the pocket of different guests. The Standard, Deluxe and Super Deluxe Rooms have been designed especially for individuals and couples. These rooms provide them ample space as well as privacy to spend some quality moments. Further, the resort also provides cozy cottages that are best suited for families and big groups. There are three cottages out of which one has two bedrooms and the rest have 6 bedrooms each. As far as the amenities of the rooms are concerned, every basic (like an attached bathroom) as well as luxury (such as a king size bed) facility is available in every room. Furthermore, the architecture of the rooms carries an essence of Kashmir and the wooden flooring and traditional textile are evidence for the same. Note: The visitors can also ask for an extra bed if required. Dinning The multi-cuisine restaurant of the hotel offers great delights to tickle the taste buds of the guests. Be it a vegetarian or non-vegetarian, the restaurant satiates the craving of both the foodies. In fact, the mere aroma of the dishes prepared in the kitchen is enough to bring the guests down to the dining area. At Tour My India, we ensure that the visitors get the hotel of their choice. 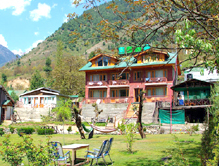 We can arrange your stay at Himalaya House, which is amongst the best and most sought-after hotels in Pahalgam.